I have a short list of items that I think are truly special breakfasts. There is something really cozy about breakfast, isn’t there? The smells, sights and sounds make it extra memorable. For me, it’s the smell of coffee and the sounds of it percolating, or of the machine grinding the fresh espresso beans. It’s also the smell of bacon cooking and that humming sizzle sound. Warm maple syrup. 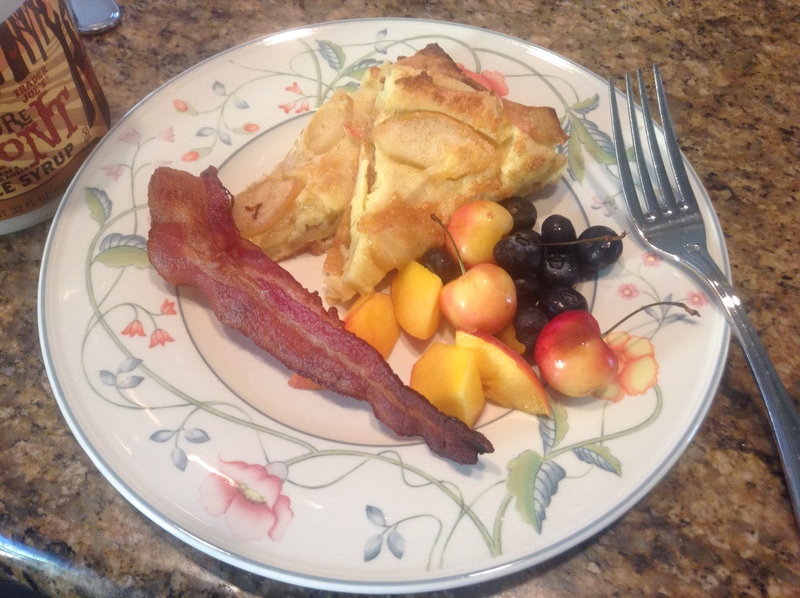 And then the view of that the rising sun streaming into the house, a steaming cup of coffee, crispy bacon and maybe some lovely fresh fruit and a particular kind of pancake… An apple Dutch baby. I think I might love the idea (and smells and sounds) of breakfast more than I actually love eating most breakfasts. I crave coffee in the morning, and when it happens, this fabulous huge pancake. 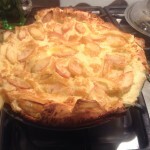 Have you tried a Dutch baby? It’s a big puffy eggy pancake that gets started out on the stove and finishes cooking in the oven. It is gloriously dramatic when presented straight from the oven and it tastes absolutely wonderful… buttery, delicate, a little sweet, eggy and slightly dense all at the same time. See some other awesome ways to use eggs here. Preheat oven to 425 degrees. Slice apple and cook at medium to medium-high heat it in an oven proof skillet (as long as it can accommodate a 425 oven, anything will work. 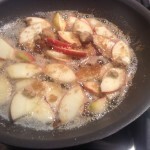 An iron skillet works well too) with the butter and brown sugar until the apples soften. 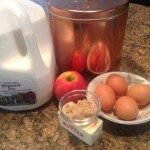 Meanwhile, put the flour, milk, eggs and salt in the blender and blend very well. 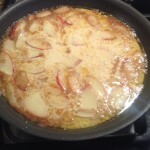 Once the apples have softened, pour the ingredients of the blender into the skillet and continue to let cook for about a minute or 2, just until you see the edges start to firm up. Put the skillet in lower third of the oven and cook for 15 minutes. Don’t open the oven! 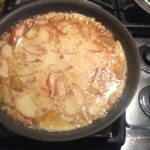 Reduce the heat to 350 and cook another 10-15 minutes, until the pancake is puffy and golden. Take it out of the oven and show it off to your friends… It’s impressive! 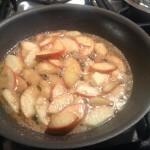 Serve immediately – I usually pop the whole thing out of the pan onto a big cutting board and slice it like a pizza. It’s lovely just the way it is, or sprinkled with a little powdered sugar, or topped with maple syrup. Enjoy! oh my gosh that looks amazing and delicious! I cant wait to try this! and now I tried it and indeed – amazing! 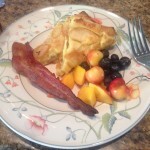 It was gobbled up in minutes this morning by my kids and husband…I hardly got a bite! I am thrilled you and your family liked it! !